Source alleges that he was talking with a Reporter from Post-Tribune about doing a “ride along” with Murchek from the Sheriff’s department. “You wanna go have some. We’ll take a ride through Gary,” Murchek allegedly told the reporter. Not too long ago, Murchek met with Gary Democratic Precinct Committee who asked him about this scenario. Source alleged that Murchek had piss poor answer. 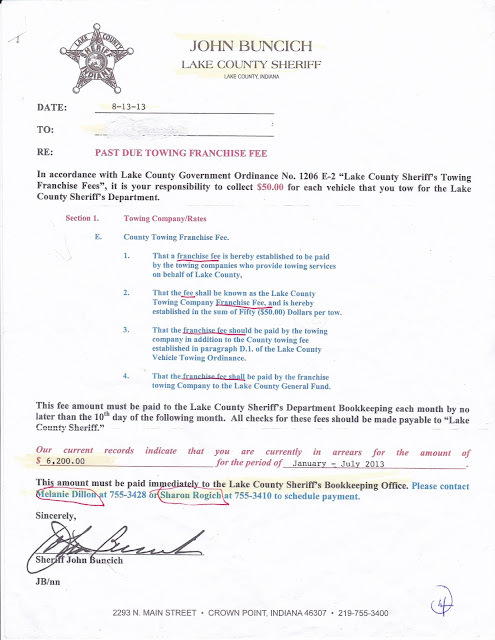 They went to “Jan’s Towing” and to sell “Lefty” fundraising tickets on company time and dime that came up the trial of Lake County Sheriff Buncich. Source alleged that Murchek knew about the Sheriff’s SUV driven by guys to Detroit to watch the Bears playing Lions. The SUV had transmission problems, and “Cocaine Willie” had to go and tow the SUV back to transmission place tight of I-65 exit. A source told me this. And now he wants to be Lake County Sheriff. Now, Murchek got amnesia and forgot that he was “tag team” with Buncich, but we haven’t forgot. This has been the latest talk going around regarding the Lake County Sheriff’s job being more of an administrative position. With this as my precursor, let me give you a narrative where Murchek was “missing in action”. Source gave me a document that showed that he owed $6,200.00 in franchise fee payments to Lake County Sheriff Department. Source further noted that he felt that the payments were illegal and didn’t pay the Sheriff Department a dime. Ditto for 2014, 2015, 2016 and some of 2017. No follow up letters or bill collectors calling him or nothing. Downs and Murchek were in charge of the towing.